Or Just Want to Understand the Rules of the Game? Equitable adjustments, terminations, claims, etc. I have expertise in the most notable government contracting accounting systems, such as Deltek GCS and Costpoint. For small businesses I have experience with Quick Books. I have implemented QuickBooks in a manner that is DCAA compliant and have passed objective DCAA audits on numerous occassions. I help make contractor accounting systems compliant, I get them through the audit and I get them approved. I particularly prefer working with small and medium sized businesses helping them win contracts, overcome DCAA requirements and challenges, maximize cost recovery and cash flow. I work with large businesses as well offering an expert resource. 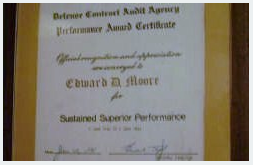 My 30 years of government contracting experience includes working as a "decorated" senior auditor for DCAA. It also includes a long tenure as a Manager for KPMG, a large public accounting and consulting firm (aka Peat Marwick) in its government contracting consulting practice. In this role I helped clients resolve DCAA and government contracting challenges. I also worked for many years in management positions for government contractors as a CFO, Controller and Contracts Manager. This experience provides me the expertise to provide comprehensive solutions to government contracting challenges taking into account the government's regulatory oversight role and the contractor's objectives. It is impossible to describe these 29 years of accomplishments and experience in DCAA and government contracting in a few paragraphs. So please view the links or contact me for more detail. If you have a government contracting problem, I most likely have a best business practices solution. I have completed over 325 projects for government contractor clients as of this writing. Below is a sampling of client testimonials.